Home » Website Building » SEO » How to Submit Your Site to Yandex? Yandex is a leading search engine in Russia having more than 65% of market share. Yandex also offers searches in English which means you have a potential to extract traffic from Russia. Previously you had an option to submit your site anonymously without registering for Yandex webmaster Tool but at this moment you need a registration for site submission. Unlike Baidu the popular search engine in China, Yandex offers webmaster tools in both Russian and English versions. Though the English version has limited features it will definitely help webmasters around the world to easily submit their site to Yandex search engine. 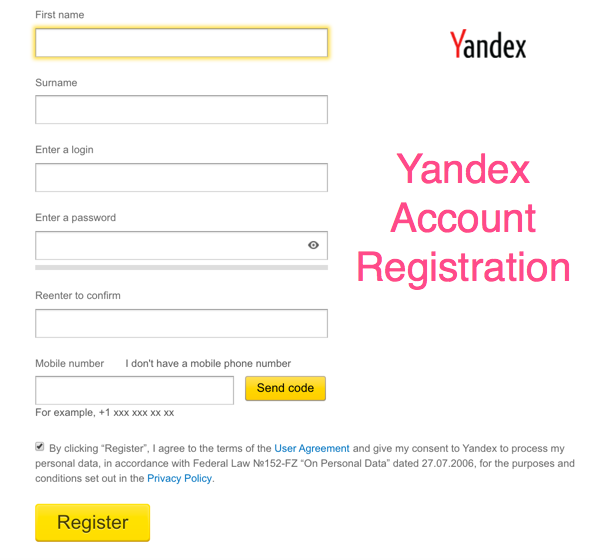 Click here to register for Yandex account. It is mandatory to have a mobile number, but you can use international numbers to get the SMS verification code. Once you have an account, click here to login to Yandex Webmaster Tools account. Enter the URL of your site and click on “Add” button. Remember to enter the correct URL with www and http versions. Once the site is submitted successfully you will be taken to the summary page. You can view all submitted sites from the dropdown on the top navigation bar. That’s all!!! You have submitted your site to Yandex. The important step after site submission is to verify the ownership rights of your site under “Access Rights” section. Refer separate article published on how to add and verify site in Yandex Webmaster Tools. After the verification of ownership, submit your Sitemap to Yandex so that all pages on your site can be crawled and indexed easily. Similar to fetch as Google option in Google Search Console account, you have an option to request Yandex crawl your important pages on priority. This is called “Reindex pages” and the option is available under “Indexing” section. 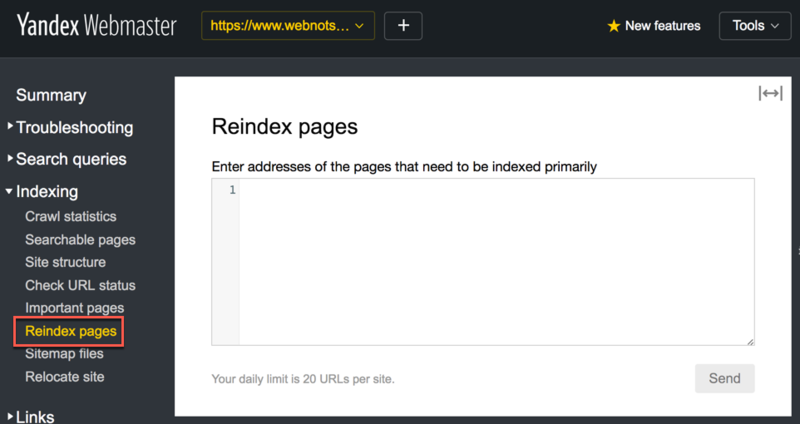 After submission of the site, if you change the content or the URL of an important page then use this reindexing option to resubmit the pages to Yandex. You have a daily limit of 20 URL submissions per site. Yandex prefers the site with Russian content and hosted in Russia. Hence, if you are planning to submit your site to Yandex make sure at least a single page in your site is in Russian. You can include the following meta tag in your Russian page so that Yandex crawler will understand that the page is in Russian. Very comprehensive and helpful guide. Now I can easily submit my site to Yadex. I added the tag to the website header, but it seems not getting verified and it’s not showing on the page source too. What to do? If all pages appear to be indexed in Yandex site:mysite.com is still needed to do that? Good post. I am worried that submitting a sitemap to Yandex would bring me more spammers and security issue. I manage a number of sites. I don’t want to add Russian content to my site. HOWEVER…Yandex seems INTENT on crawling my site…except despite the fact that I have a sitemap and a robots.txt file, they keep trying to crawl pages that haven’t existed for 8 years or so. I don’t “really” want to submit to them, but if they insist on crawling, I don’t want to block them, I’d just like for them to get it right.